The term claiming one’s Sovereignty has become quite fashionable in recent years, since it was taken up by the Freeman on the Land people. In the mouths of such political activists, it has become a sort of buzz term, a comfort blanket or flag for them all to nestle under in the hope that this magic word will make the bogeyman go away. But whether or not it will stop the worst excesses of the New World Order is yet to be shown. I’m doubtful, because I believe that the concept of Sovereignty has been misunderstood. According to my understanding, Sovereignty is not something that any one human being can claim, in isolation or even in a group. It’s also not political…. but spiritual. Sovereignty comes from the Land, in particular, it comes from the spirits of the Land – in other words, the interdimensional entities which maintain its fertility that are otherwise known as the Fae, the Sidhe (to the Irish) or the Gentry. For hundreds of thousands of years, at least, shamans have worked with the spirits of the Land, to maintain its sacred ways and spiritual purity of the Dragon lines, or leylines, so that they continue to mirror the Above on to the Below. It is this harmonic partnership between Man and Fae which leads to an affirmation of the Sovereignty of the Land. It is a sort of transmission from Fae to human. All this was widely understood and practised, across the civilised world, until about 1600 years ago, when the Christian church began to drive such practices underground. The interdimensional spirits were banished from our collective consciousness by a mixture of misinformation, mind programming and terror. If you don’t know the word for something, you can never find it… or even know that you should search for it. In other words, we don’t know what we don’t know. And we can argue about whether this miseducation was carried out deliberately or that it has accidently happened. But there is one thing we can, I hope, agree on: that, until now, that knowledge had been lost to us and it is being reconstituted again by shamans in partnership with their spirit guides. To my mind, it has never been more important to bring back these practises because we are in danger of losing our connection with the Land, by which I mean, our connection with the spirits of the Land. And when this happens, we are much more susceptible to foreign or global corporate takeover by those who act like ambush predators. Without being rooted to the Land, we can be blown around like just so much chaff on the wind. This connection to the Land is achieved through the actions of the shamans, and also through the stories that our ancestors told. Our stories are about who we are… this is why they’re so important. So in this article, I will describe the importance of Sovereignty in magico-spiritual terms and also explain how it is seeded into our own myths in these Isles. This will hopefully provide you with a cognitive framework to go on and read The Glastonbury Declaration, which I have been guided to write, and which we read out within a shamanic ceremony celebrating the Birth of the Radiant Child at sunrise on the Winter Solstice, 21st December 2014. To many people of these fair Isles, the Welsh sometimes seem an odd lot …. smaller than rest of us, more argumentative with a difficult to understand language… albeit, they’re renown for their great singing voices. So it might come as a surprise to hear that the indigenous people of Britain are not the taller, fairer and less excitable Anglo Saxons and Normans among us, but the Welsh. Not only that, but these original Brits have their own mythology which is largely contained in a huge book called The Mabinogian. In fact, Wales is the last remaining outpost of Merlin’s Precinct, which was one of the older names for the Island of Britain. Some of the stories of the Welsh reflect the shamanic practices of the Celtic ancestors who worked with the spirits of the Land to achieve Sovereignty. The kings of old understood this… that the power to rule didn’t come from them, but from the Land, the spirit of which is often depicted as a beautiful woman or goddess. “We say that when monarch rules wisely, he or she has the Sovereignty of the Land. This has come to mean that the monarch rules according to laws which he or she imposes (from the French ‘souvrain’, ‘one who is supreme’). However, behind this notion is the personification of the Land by a mythical female figure. The monarch holds the Land by right of his union with her, and by his championship of her freedoms and privileges over which he lawfully presides. Land and king must be in harmony, as husband and wife. 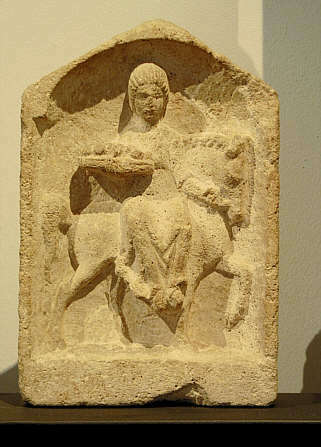 The horse was also another representative of the Land and Sovereignty, and this is why Rhiannon and the French Epona are depicted riding horses. It’s probably also why we’ve seen several instances in recent years of horse mutilation, especially in the West Country. It’s an occult sign of imminent foreign invasion and takeover. In my shamanic journeying, and more Earthly research, I’ve found that one of the stories of The Mabinogian is being played out on a massive round theatrical stage here on the Somerset Levels. It was called a Temple of the Stars by Katherine Maltwood, its discoverer in the 1920s, and the Glastonbury Zodiac by Mary Caine. Mary Caine writes in The Glastonbury Zodiac: Key to the Mysteries of Britain. “The Glastonbury Zodiac is the earthly counterpart of the Caer Sidi of the Celts – a great Star-Temple, reflecting in its natural contours and streams the Zodiac in the heavens. So accurately indeed does it mirror the heavenly pattern that the stars of the Zodiac fit over its earthly effigies when the planisphere is scaled to the map of Avalon. “That this antiquity has lain so long forgotten is due, paradoxically, to its immense size. It is literally too big to be seen. These giant figures – one of them is five miles across – lie stretched over the Vale of Avalon in a great circle ten miles in diameter. 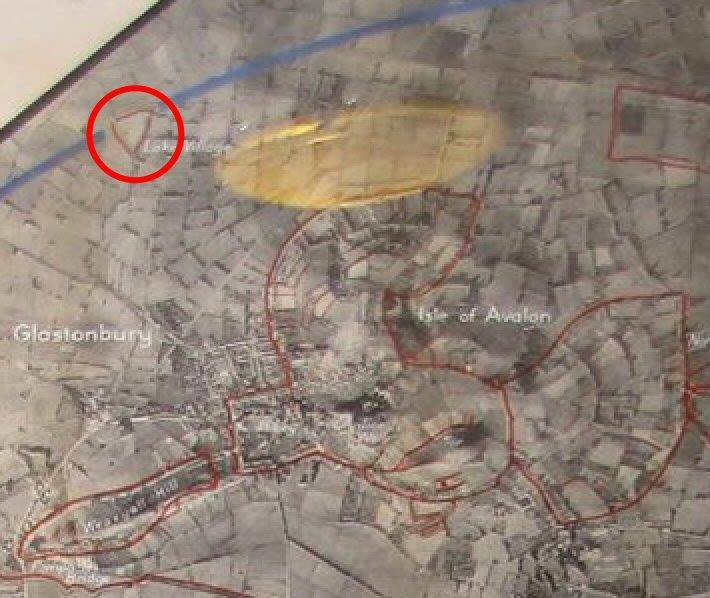 Glastonbury Tor is its northern sighting point; Somerton and Lytes Cary bound it on the south. The effigies are formed and outlined by hills, contours, earthworks, roads, paths, ancient field boundaries, and by natural and artificial waterways. “Who made it? When? And why? There can be no doubt that this Zodiac in essence, is natural. Its huge figures moulded by hills and lesser contours is partly outlined by rivers and streams whose course is determined by them. The whole complex measures some ten or twelve miles across, thirty miles around and can hardly be the unaided work of man. No, it was modelled by a vaster hand; whether we like to call it Nature, Cosmic Forces, or simply God. “So the question… it seems has a dual answer; it was made by Nature in the first place, and continued by man. The Zodiac can be seen in 20th century maps perhaps more clearly than in the past. The paths are widening into motor roads and some are becoming dual carriage-ways. Yet this is not to say that the design was unknown, unrecognized. There is indeed much evidence in early writings to show that it was known. “The second question “When was it made?” must then take us back to the geological ages when the hills were first formed and the streams first began to flow. But this was only the beginning; its continuous development embraces all the ages of man down to the present day. “The third question, “Why was it made?” has already been answered by Dunstan’s biographer with commendable succinctness. It was prepared, he tells us, “for the salvation of mankind”. I personally don’t see this huge circle on the landscape as a traditional zodiac, and actually, it really takes a bit of the stretch of the imagination for that model to work. It’s also made up of 13 huge, landscape effigies, not just 12, and 13 is a ‘faery number’. So I see it another way, as a Faery Ring. 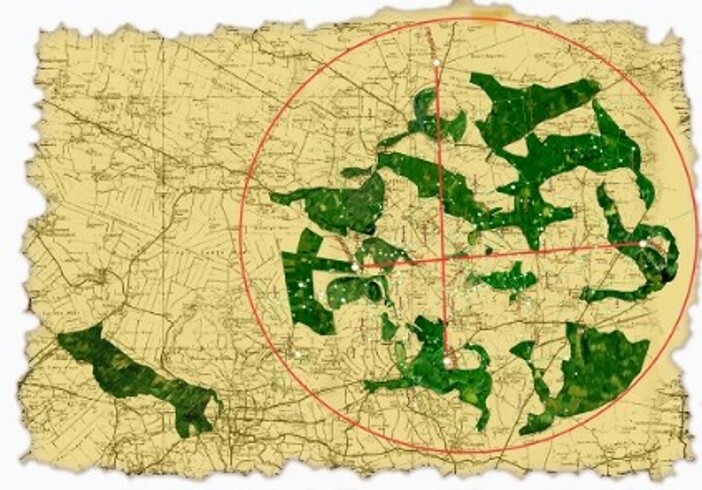 The vision of the landscape circle as a Faery Ring first came to me from the shaman Coleston Brown, which I first read about in The Signs and Secrets of the Glastonbury Zodiac, edited by Yuri Leitch. I then got hold of a couple of Coleston’s books*, and then I got in touch with him, in Ireland, to tell him that I’ve been journeying with his geomancy, in and out of the Faery Circle in the Middle World, and receiving guidance on how we can reaffirm the Sovereignty of the Land. One of the effigies, to the east, is the Faery Stone, situated in the village of Stone. I have journeyed into that Stone to receive guidance for the work which we’re about to commence on the Winter Solstice. Three-score centuries of men stood upon its wall. I have heard the Fae singing to a sort of marching tune where they are swearing to ‘protect forever the Glassy Wall’. Around here, some of the canals across the Faery Ring are known by their old names of ‘walls’. To me, it was quickly becoming clear that the Glasshouse is the Glastonbury Faery Ring, and the Thirteen Treasures are the 13 effigies or landscape giants. And if ‘three-score centuries of men’ stood upon its Glassy Wall, the poet either means that this Faery Ring is 6,000 years old, or the Roman century which consists of 100 soldiers. The story that I’ve been shown, and which is reflected by the stars, is that of The Birth of the Radiant Child, which comes out of the alchemical marriage between the Faery King at Baltonsborough (Dunstan’s birthplace!) and the Faery Queen whose form stretches alongside the south-east course of the River Cary. It is the oldest story, as old as these green and rolling hills and dales which express it in their own way, and it’s the story of Mabon and Modron, the Son and the Mother. There is some evidence that a magician with the name of Merlin, or with a name very much like it, did once exist. But at the risk of offending the tourist traders of Glastonbury and Tintagel, I think here would be a good place to point out that there is no evidence in history of an actual King Arthur who lived in a place called Camelot. So why are stories about Arthur Pendragon so popular? Pendragon means ‘head dragon’ or ‘head serpent’. The serpents were the wise spiritual teachers of ancient times, and so Pendragon is more a title of office than a person. Arthur means Great Bear, like the Ursa Major constellation, which can be often seen over Glastonbury Tor. In other words, Arthur Pendragon is a fictional character in a metaphorical teaching story about cosmological processes which are begun by Mabon of The Mabonogian. In the Welsh stories which feature Mabon, the Son, and Madron, the Mother, we see all the archetypal themes played out as he travels around this landscape calendar from his birth through to manhood as the young Pendragon warrior hero or knight, at the Spring Equinox, then on to maturity as the king, Arthur Pendragon, at the Summer Solstice, then to the Fisher King at the Autumn Equinox, and ultimately the death journey to the Underworld (Annwfn) as Pen Annfwn, the elder Pendragon, where he wins the hallows, the accoutrements of kingship, and then finally resurrection as the young child, Mabon, again, on the Winter Solstice. 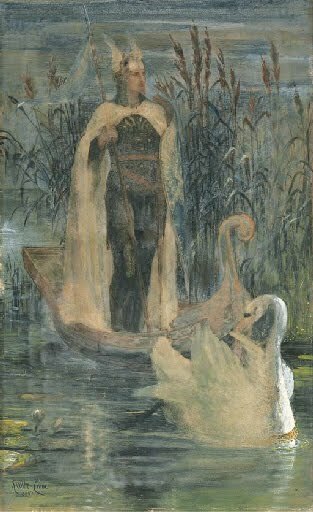 This story of Arthur winning the hallows, the Sovereignty, is told in the ninth century Welsh poem, Preiddeu Annwfn or The Spoils of Annwfn, which is attributed to the bard Taliesin. I praise the Protectory, leader of the realm, king. The cauldron of the head of Annwfn, what is its form? 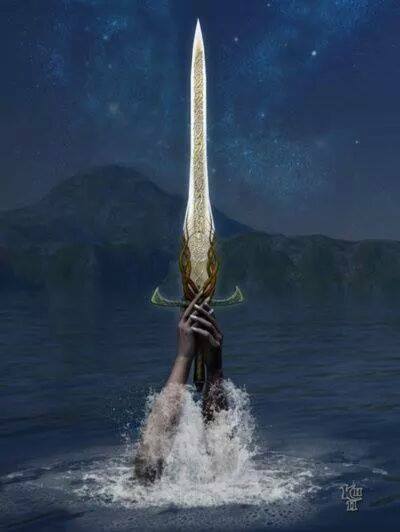 The flashing sword of Lleawg was not raised to it. And in the hand of Lleminawg was it left. And before the door of uffern lanterns burned. It was difficult to discourse with their sentinel. what hour of the mid-day was Cwy born. When we went with Arthur, sorrowful strife. Is there one course of wind? is there one great water? Is there but one spark of fire, of unyielding tumult? How many saints lost and how many altars? I shall not be sad, Christ endows me. In these verses, we can see that even by the 9th century, the allegorical, cosmological meanings of the sacred myths were being lost to the priestly classes, who ‘know not when midnight and dawn divide’. In other words, a schism is appearing because the Christian church was wanting to replace our own myths with their own, as if they were superior. However, at their core, stories about the birth of Jesus are very similar to those about the birth of Moses or the birth of Krishna or the birth of Buddha… or the birth of Mabon, in that the Nativity is a mythological metaphor representing universal truths, and not necessarily a historical event. The story of Mabon and Modron comes from a much older time than when the first solar-oriented zodiac was first conceived. It comes from a time when the moon and the stars were just as important, and particularly the Pole Star. The earliest Egyptian myths are not about the hero’s journey around the Sun, but around successive pole stars, showing that they knew about the changing pole stars and the precession of the equinoxes. In the moon boat journey of the Faery Child around the moat of the Faery Ring, we also find the older lunar lore as well as that of the stars. The Faery Swan which forms Glastonbury Tor and Wearyall Hill, under the Royal Star of Fomulhaut. In ancient lore, she is Brigit who takes flight at Imbolc to carry the Faery Child, as the hare, to the Spring Equinox. (Thanks to Donald Allen for this image). These royal stars form the basis of the Excalibur sword under which we stood to make our Declaration about our Sovereignty, at the celebration of the Birth of the Radiant Child in the Faery Boat which takes place on the morning of the Winter Solstice, Sunday 21st December, just as the sun begins its slow climb up the Tor. As Above, So Below – the story being told in the sky is mirrored on the ground below, so we marked the celebration of the birth of the Faery Child three times on that day. The first time was at four hours before sunrise, when the Sun aligns with the Sun in the Lower World or Underworld. The next time is sunrise, and the third time is at midday on the same day, when the ecliptic of the Sun crosses the Milky Way and forms a vesica piscis over the Tor. At some time in the evening, the three stars of the belt of Orion come from the east and appear over the Child in the Faery Boat – in other words, these are the Three Wise Men or Three Kings. The Faery Boat here aligns with the constellation of Cancer which has a star system that appears in the ancient Wisdom Teachings as the allegorical story of asses eating hay at the manger. This is the final version of The Glastonbury Declaration, which I was guided to write from my work with the spirits of the Land. Please do share it as widely as possible, as I hope it will inspire others to do the same or similar. Sovereignty comes, as a transmission to man, from the spirits of the Land. Shamans worldwide can use this as blueprint after contacting the spirits of their own Land. This is the Declaration and Intent of all of us here, in this circle, who live within the Sovereign Circle of the Thirteen Treasures of the Precinct of Merlin. The Thirteen Treasures were brought to the Glass House by Merlin for safe-keeping upon receiving them from King Bran in those days of antiquity, when our ancestors worked in harmonic cooperation with the spirits of Land. The Glass House, or Glastonbury, over which the Tor rises as sentinel, is a multi-dimensional Faery Ring which exists in people’s hearts and dreams wherever they are on the Earth …. and beyond. This Land has manifested itself across all the Realms – the Over Realm, the Middle Realm and Under Realm – through the loving companionship between Man and Fae. For this reason, the Glastonbury Declaration resonates throughout the Three Realms, with which we are in alignment and harmony, as we stand under the Excalibur of the Royal Stars ruling over this sacred Land of the Nobles, as Above, So Below. As the ancient kings of these islands knew, this hallowed ground around which the Thirteen Treasures revolve, mirroring the starry constellations, is pregnant with their legitimacy to rule, and that he or she who holds the reins of this Land, reigns over all the Land. We hereby affirm the Sovereignty of the Land as a flowering and fruiting of the relationship between Man and Fae, which once manifested, cannot be countermanded by any other authority. 1. From this Day forward, we Declare as Sovereign Beings that we owe no allegiance to any man but to our own individual Destinies, which are weaved from rainbows and stars in the Spindle of Light which traverses the Three Realms. 2. We Declare that it is our Divine Destiny to individually explore our own relationships with the spirits of those Other Realms, who some men have called ‘the gods’, which exist independently of all religious belief systems, political parties, castes or creeds. 3. We Declare that we will always walk a path of Truth, Goodness and Beauty across this sacred landscape, in harmony with the Spirits of the Land, and we will support all others to do the same. 4. We Declare that we will honour our responsibility to work with the Spirits of Land, to keep the Dragon Lines consecrated so that they clearly mirror and resonate with the Vault of the Stars Above and the Well of Stars Below. 5. We Declare that we are responsible for respecting all laws of the Land, and that we will give no quarter to those who don’t, including those who have been appointed by government to keep the peace and administer the laws. 6. We Declare that we have the right to a fair trial in which we are presumed innocent until and unless proven guilty, and that we also have the right to be judged by a jury of our own peers that reside in our own locality. 7. We Declare that as Sovereign Beings, it is our glad right and duty to bring up our own children, which are our property, and it is our responsibility to keep them safe and with no harm being suffered to their person. 8. We Declare that we will only take part in wars which we deem to be just and necessary to protect our peoples. 9. We Declare that we have a right to clean and unpolluted air, water and soil and that we will take on the responsibility to prosecute any person or corporate body that pollutes them – whether from the skies, seas or lands. 10. We Declare that we have a right to fresh and unadulterated food that is grown as Mother Nature intended and we will take on the responsibility to encourage others to eat healthily. 11. We Declare that we have a right to live wherever we want to live, on this land of Britain, and how ever we want to live, within the law of the Land, and we will be responsible for all our own decisions in such regard. 12. We Declare that we will be responsible for overseeing the care of our own people, from the cradle to the grave. 13. We Declare that if government at any time acts in a way which forces us to live in any way contrary to our Declared Intentions above, and to our guardianship of Glastonbury, The Thirteen Treasures of Merlin’s Precinct, we will withhold from them our consent as it is our Sovereign right to do.